In a world of stiffening competition, business strategy is more crucial than ever. Yet most organizations struggle in this area--not with formulating strategy but with executing it, or putting their strategy into action. Owing to execution failures, companies realize just a fraction of the financial performance promised in their strategic plans. 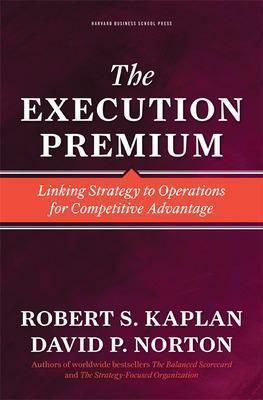 It doesn't have to be that way, maintain Robert Kaplan and David Norton in The Execution Premium. Building on their breakthrough works on strategy-focused organizations, the authors describe a multistage system that enables you to gain measurable benefits from your carefully formulated business strategy. This book shows you how to: Develop an effective strategy--with tools such as SWOT analysis, vision formulation, and strategic change agendas Plan execution of the strategy--through portfolios of strategic initiatives linked to strategy maps and Balanced Scorecards Put your strategy into action--by integrating operational tools such as process dashboards, rolling forecasts, and activity-based costing Test and update your strategy--using carefully designed management meetings to review operational and strategic data Drawing on extensive research and detailed case studies from a broad array of industries, The Execution Premium presents a systematic and proven framework for achieving the financial results promised by your strategy. Illustrations note w. num. figs. Robert S. Kaplan is the Baker Foundation Professor at the Harvard Business School. David P. Norton is a founder and director of the Palladium Group, a consultancy focusing on strategy execution.